Ogden on Politics: Is ACS Misappropriating City Property? Is ACS Misappropriating City Property? ﻿ParkIndy has drawn criticism for leaving rusty meter poles and bases and replacing only the heads. 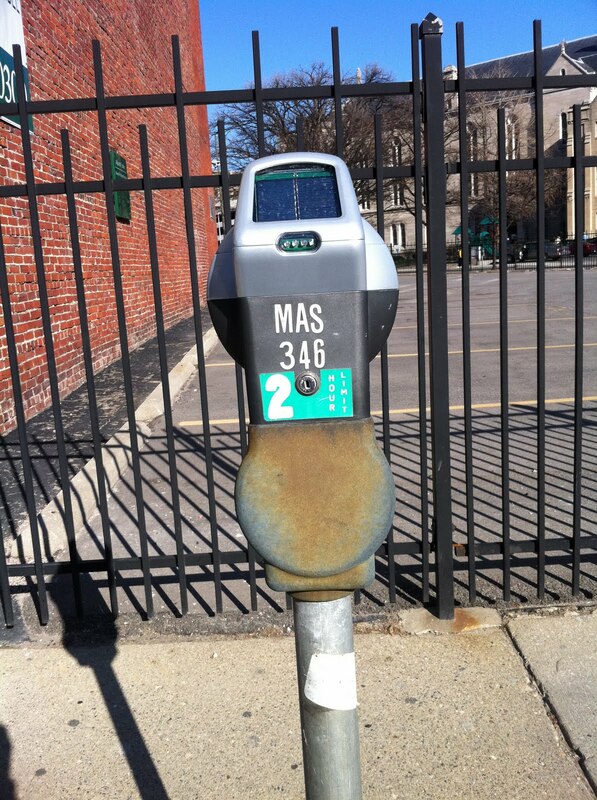 Lou Gerig, a spokesman for ParkIndy, said that as pay boxes go in, leftover meter parts that are in good condition will be used to replace older hardware on remaining individual-space meters. ﻿﻿The multi-space pay boxes were the cornerstone of what councilors were sold when they approved the deal last year. ACS is installing the electronic meters on the poles for now, which are actually used meters that were removed from another city where they were previously used. By installing the older technology now, ACS is getting immediate access to revenues it will generate from the 50-year lease that includes the higher rates and extended hours. ACS will use those revenues to finance the cost of installing the more costly multi-space boxes over time for most but not all spaces. ACS plans to use newer poles already purchased by the city to put on the remaining parking spaces where it intends to use its used electronic meters. In other words, ACS and the Ballard administration flat out lied about how much money ACS would invest up front to install new parking meter technology. Read closely the italicized information in the two quotes. Am I reading that right, that ACS, er "ParkIndy," is going to appropriate city property as its own instead of supplying the hardware? We taxpayers own those meters that they plan to cannibalize and use for parts for other meters. We taxpayers bought those poles. Where in the contract did we as a city give that property to ParkIndy? 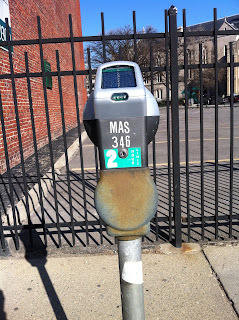 Wasn't the deal that the vendor was supposed to provide the hardware for the parking meters, not the taxpayers. As a side note, it's interesting to hear IndyPark's spokesperson, Lou Gerig change from day to day the story about when ParkIndy is actually going to replace the parking meters. Note: Picture is from the Indianapolis Times story on the parking rate increase which can be found here. Paul, If you look around the downtown area, many of those poles have been replaced with new poles over the last year as sidewalks are installed. ACS is not paying for those meter poles. Even the electronic meter heads on those existing poles are not new meters. Presumably, the pay boxes will be new, but they could theoritically be boxes swapped out from other places as well. The City of Chicago has a tough time with its pay boxes. People smash into them with their cars and even steal them in protest of the outrageous parking rates there. If you look how often these meters on poles get hit by cars now, I can only imagine how many times these pay boxes are going to be struck or vandalized. When people get tickets, they get pissed off and back into them deliberately. Don't you think our crack city negotiators could have put something in the contract about ACS providing us NEW parking meters? I still cannot believe this administration locked us into a 50 year contract for which there is no realistic way of escaping. Ballard mortgaged our future and got virtually nothing in return. Of all the boneheaded proposals from the Ballard adminstration this rates as the worst. How about running a story on how the young Republicans are running from the party as fast as they can. The old school guys like Delph and Mourdock are running us off.These guys need to get with the program. get some real work done at the statehouse,not legislate if two people can get married. The Repubilican party is imploding under its own weight, hint Mr. Mayor? Ben, I think Delph and Mourdock are some of the highlights of the Republican party. I think both are men of integrity. I might not agree with either on some (or even a whole lot), but Delph was the first politician to voluntarily return the dirty money from Durham. Without being asked. He just did what was right. I've heard nothing but good things about Mourdock from both people in the GOP older than me and those closer to my age. Now, the county party, that's a completely different story. The county party is in absolute shambles. Matt,My problem with them is their total disrespect for Sen.Lugar.They both feel that they need to dictate their 1950 morals on todays society. They claim to be Reagan Republicnans,but they both throw the 11th Reagan commandment in the toilet. Uh, Ben, when did Mike Delph say anything like that?